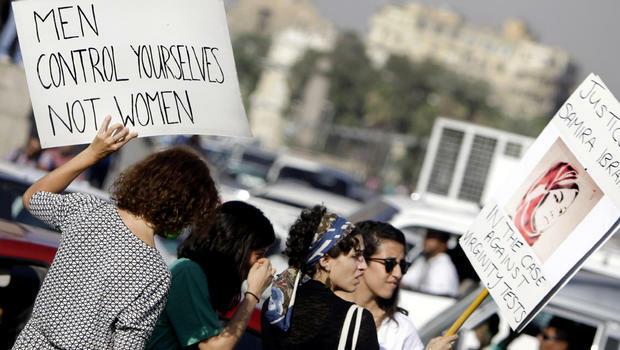 FILE – In this June 14, 2014 file photo, Egyptian women hold banners during a protest against sexual harassment in Cairo, Egypt. CAIRO — It might have been another #MeToo moment: An Egyptian woman says a man stalked her at a bus stop, made inappropriate advances, and only backed off when she began filming him with her cellphone. The poll, which surveyed 1,380 men and 1,402 women in five governorates, found that 74 percent of men – and 84 percent of women – agreed that "women who dress provocatively deserve to be harassed." Forty-three percent of men said women "like the attention" when men harass them.